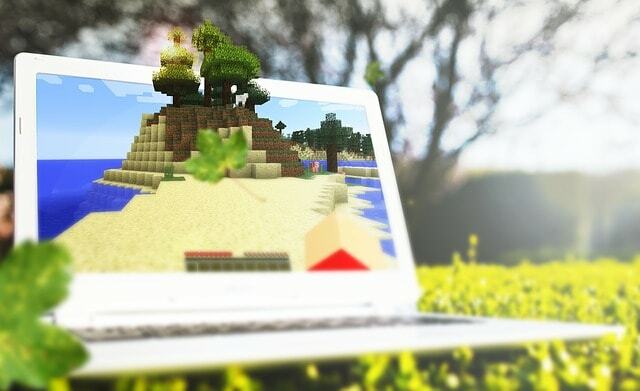 Are you looking for the best sleeve for MacBook Air? Don’t worry, you arrived at the right place. Here are the best new MacBook Air cases and sleeve 2019 that can protect your new MacBook Air from scratches. They not only protect your laptop, but you can also customize its look with a new MacBook Air sleeve. MacBook Air is one of the thin and lightweight laptops in the world. Because of its thin design, they can be easy to damage. 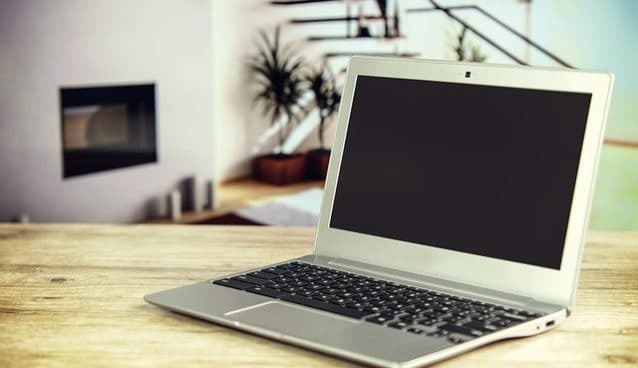 If you are going to be out or you want to able to put your laptop into a larger bag without worrying about scratches or any other kind of damage, then a case or sleeve is probably a wise investment. Canvaslife bags are famous for their stylish pattern looks. 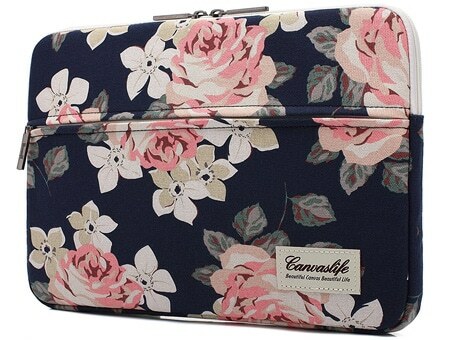 If you looking to buy a laptop sleeve with beautiful pattern design then this White Rose Pattern sleeve from Canvaslife would be perfect for you. It is a soft and slim laptop case built with the premium quality material. This laptop sleeve is made up of waterproof and shockproof material to keep your laptop safe from water damage and any physical damage. It has a front zipper pocket which includes holders for stylus or pens and additional pockets inside that you can use for charger and USB mouse. The case is available in multiple sizes for different laptops. 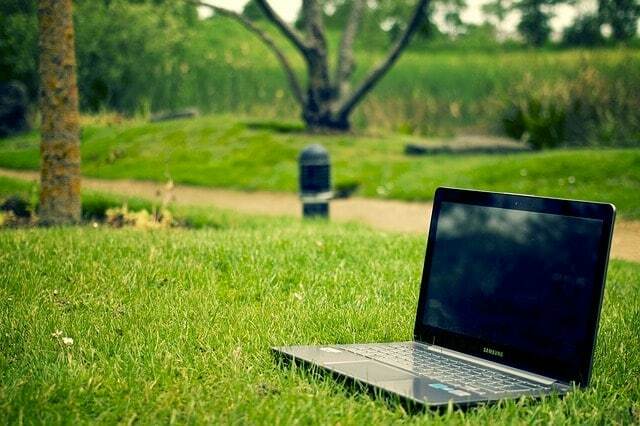 You can choose any of the size as per the measurements of your laptop. Living a bit of the rougher life? Then this bumper sleeve case from Mosiso is what you need. It can provide protection to your MacBook Air in all the right places. 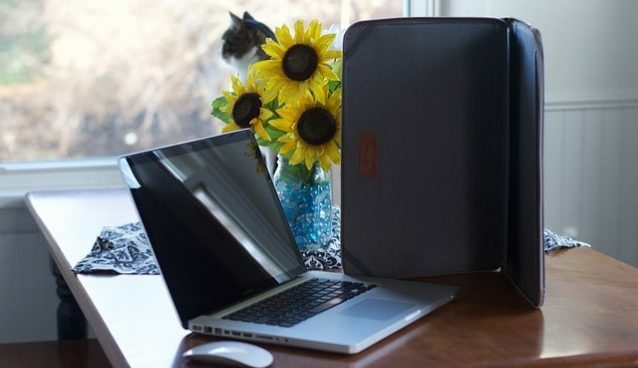 It features a polyester foam padding layer and fluffy fleece fabric lining for bump and shock absorption and protects your computer from accidental scratches. It is slim and lightweight sleeve case so you can easily slide into your briefcase, backpack or another bag. It is available in twelve different colors, you can choose any of them depending on your preference. Apart from MacBook Air 13, it also compatible with other laptops including MacBook Pro Retina 13, Microsoft Surface Book 13.5, Surface Laptop 2017, Dell Inspiron 13 5000 2 in 1, 2017 HP SPECTRE X360 13.3 2 in 1, HP Envy 13, HP Pavilion 14, Lenovo Yoga 720 13.3, Acer Swift1 13.3, Acer Swift7 13.3, and most popular 13-13.3 inch Laptops / Notebooks / Ultrabooks. 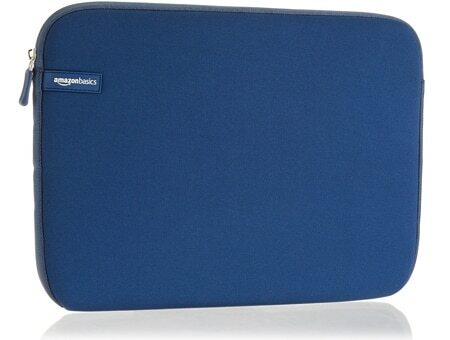 This is another best MacBook Air sleeve case manufactured by AmazonBasics. It comes with a slim design that allows you to easily carry the case by itself or in a bag. 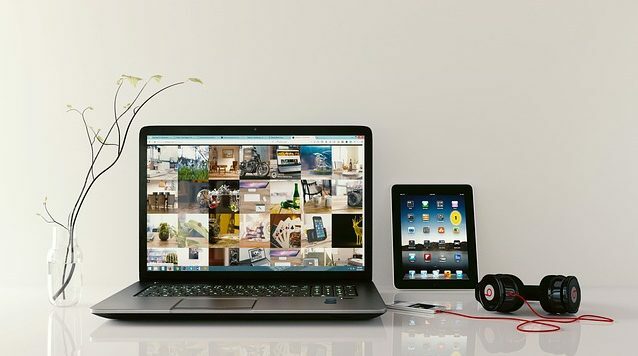 It is perfectly fit for MacBook Air 13 and apart from that, it is also compatible with other types of laptops and ultrabooks. This laptop sleeve is available in five different colors and you can select any of them based on your choice. The AmazonBasics laptop sleeve is available in multiple sizes for different laptops. For this review, we have selected a 13.3-inch size for the case. It may not have any extra pockets, but it will provide you with great storage for your laptop. As many customers have written good reviews about this product, it would be a great choice for your MacBook Air. The iDonzon plastic case is a soft touch plastic hard case cover for MacBook Air 13 inches is designed to be sleek and stylish. It contains a floral transparent layer of rubber oil coating for a smooth rubberized exterior texture. To elaborate, it is made of 100% high-quality, durable, eco-friendly and light-weight hard plastic material. It will protect your new Mac Air from scratches and abrasion and is easy to put it on/off. This hard case cover is compatible with old and new 2018 version Apple Macbook Air 13″ with various model numbers. You will also get 3 months guarantee if the case is damaged or cracked after normal using. 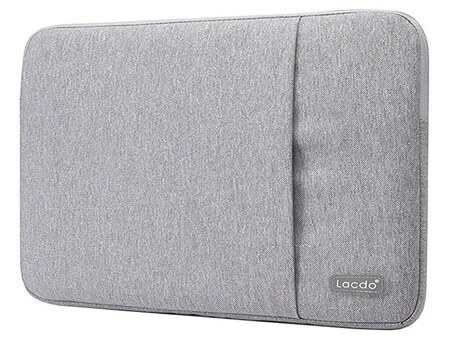 Lacdo is a popular brand in terms of manufacturing awesome sleeves and cases for laptops. This waterproof sleeve is perfect for your delicate MacBook Air. It is entirely made of waterproof Canvas fabric, which obstructs water and vapor effectively. So, you can easily protect your MacBook Air from splashing water or rain. This laptop sleeve has one pocket, which provides you with enough space for keeping document and accessories. The Lacdo MacBook Air sleeve case is available in seven different colors, you can any of them depending on your preference. The case also fit with 13-13.3 inches MacBook Pro Retina 13, 12.9 inch iPad Pro 2017, Microsoft Surface Book 13.5″, HP SPECTRE X360 13.3 Inch, Dell Inspiron 13 and other popular 13-13.3 inch Laptops or Notebooks or Ultrabooks. 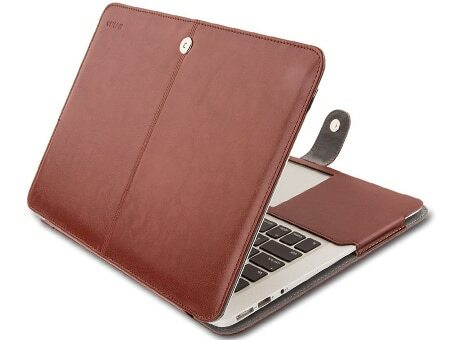 This is a premium PU leather folio cover from Mosiso with stand function offers a fashionable design and superior protection for MacBook Air 13 Inch. The laptop case is built with superior durable quality leather with shock-absorbing features. Its unique protective design allows operating your MacBook Air 13 freely without removing the case. This laptop case is available in multiple color option. 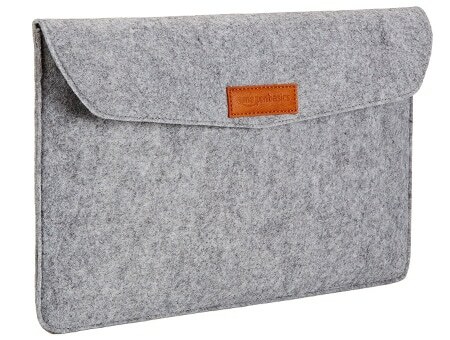 Furthermore, this laptop sleeve is inexpensive and has got good customer reviews. This laptop case only fits MacBook Air 13 Inch No CD-ROM (A1369 / A1466, Version 2017/2016/2015/2014/2013/2012). So, please check the model number “A1xxx” on the back of the MacBook BEFORE your purchase. 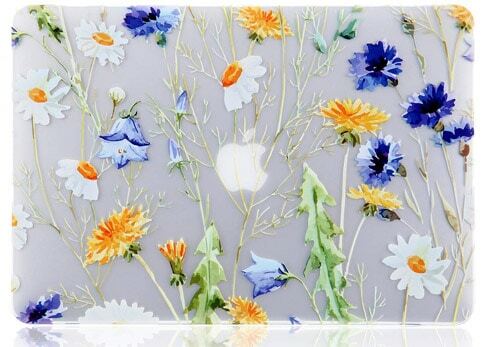 Another great MacBook Air 13-inch case cover from KEC. It is entirely made of premium materials to protect your notebook from dirt, scratches, scrapes and other potential damages. With its precise design, you can fully access to all buttons and features comfortably. KEC Mac Air 13.3 inch case cover is very Slim and lightweight which makes it easy and convenient to carry around with your bags. With this hard case, you can easily access to all ports, battery, and all other important plugs. The laptop case cover is available in different beautiful pattern designs. You can pick any of them as per your choice. This MacBook Air 13 Inch case cover is for model number A1369 / A1466 only so you should check your MacBook model number before purchase. 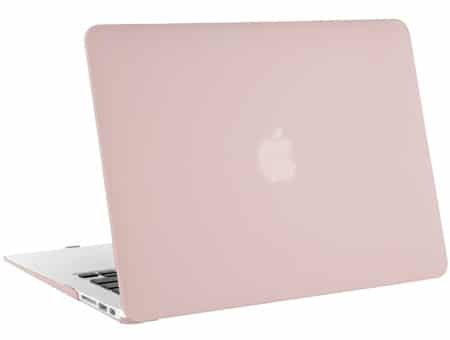 This Rose Quartz plastic hard case comes with a matching keyboard skin for your charming MacBook Air 13. 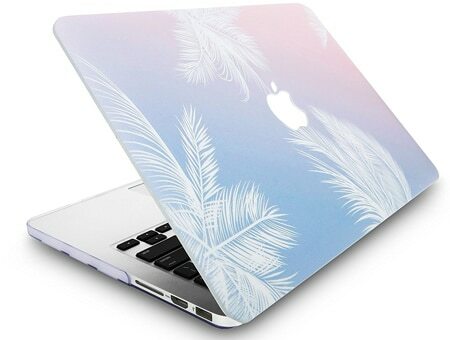 To elaborate, it is made of polycarbonate material that protects your MacBook from scuffs and scratches. This case also comes with 1 matching keyboard cover and 1 screen protector that you are going to love. This case is designed for MacBook Air 13 inches model A1369 and A1466. Overall, with clear design and durability, Mosiso plastic hard case is the perfect case for MacBook Air 13. 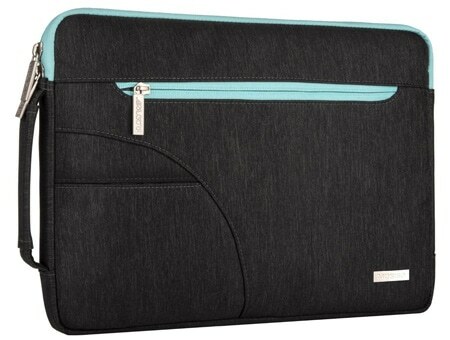 AmazonBasic’s slim sleeve is a gorgeous combination of leather and canvas that stylishly protects your MacBook Air. Its interior lining consists of a soft suede fabric that won’t scratch your computer for long-lasting performance. The laptop sleeve provides the main compartment for your laptop and a second, slightly smaller front compartment for a tablet, books, pads of paper, magazines, or other similar items. The laptop sleeve also comes with two back pockets for keeping smaller items such as a wallet, a smartphone, earbuds, or ID cards. This laptop sleeve fits 13-inch MacBook Pro Retina / MacBook Air and most 11-inch Ultrabooks and MacBooks but it doesn’t fit 13-inch laptops with hard-shell cases. 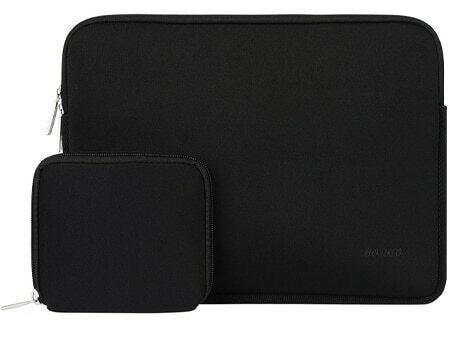 This is another great looking Mosiso laptop sleeve bag in our list of top 10 best sleeves for MacBook Air. This MOSISO protective laptop shoulder sleeve bag is made from a premium eco-friendly polyester material, which protects your laptop from water, dust, dirt, and scratches. Its exclusive trendy design giving it a fashionable look that enables you to carry your laptop in a uniquely sleek style. This laptop sleeve has two additional pockets to store your personal items with extra protection such as phone, charger, adapter, mouse, wallet, credit card, keys, etc. This sleeve bag comes with a removable padding shoulder strap which allows you to switch between a handbag and laptop sleeve bag. Apart from MacBook Air 13, this sleeve cover is perfectly fit for MacBook Pro Retina 13, 12.9-inch iPad Pro 2017, MacBook Pro 13 – A1278, Microsoft Surface Book 13.5″, Dell Inspiron 13 5000 2 in 1, 2017 HP SPECTRE X360 13.3″ and many other 13-13.3″ laptops. These are the top recommended MacBook Air sleeves and cases in 2019. So before buying any MacBook Air cover, read reviews and check the design and material that has been used. This will help you to ensure the quality of the product and choose the one which suits your requirements. I hope you like this review guide of best MacBook Air laptop sleeves. If you have any doubts or any suggestions about the laptop covers, feel free to ask in the comment section below.